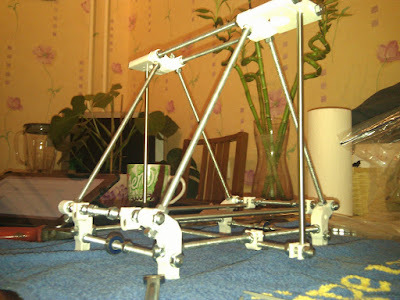 So, it's been years since I really built anything and I've been following the RepRap community with interest for a while now. The ability to be able to print a 3d model just seems amazing to me, and although practical uses might be limited at first, it's still interesting enough for me to want to try it. The primary reason I started looking around for a 3D printer was because I have several little electronics projects and kits lined up for my summer evening entertainment, and was looking at all the little project boxes available to house them. Of course there are hundreds of different ones to buy, but they are all so...boring and standard. I started thinking about the ability to create custom boxes for myself, tailored specifically for my little projects which lead me to ABS type research which lead me to...the eMaker Huxley RepRap machine. You can see the eMaker website here and the design I'm currently working on is their Huxley model. 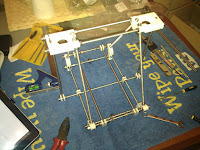 So, what's a RepRap? It's a Replicating Rapid prototype machine. Bit of a mouthful I know, but the principle is pretty exciting - a machine that can create a copy of itself! Of course, the machine can do more than only create another copy of itself - it can be used for creating pretty much any 3D object that you can model in a CAD program, from toys to tools, art to ashtrays - and of course...custom boxes! There is also a growing community of users who create designs of objects that can be printed out freely, which are shared free of charge - a good example of this is Thingiverse which is a community I hope to contribute to as soon as this project is done! Of course, the printer can only produce the plastic parts required to create a copy of itself; the various electronics and hardware such as rods, nuts and bolts etc need to be sourced elsewhere. 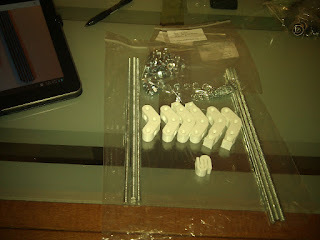 The open design, and well thought out materials lists mean that it shouldn't be too difficult to find all the bits required either locally at the hardware stores, online, or in a kit form such as this machine. The slide show below (unless you're unfortunate enough to be using an iPad it seems) streams all available shots as they are uploaded by my phone, so is likely to be more up to date than the blog below for a while. Clicking on the slideshow should take you to the Picasa repository, but if not, it's here. 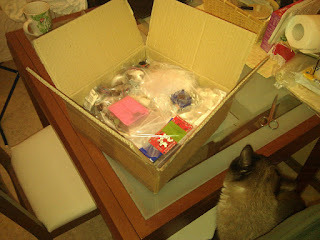 So here's a box of many, many bits that will eventually be the RepRap printer. 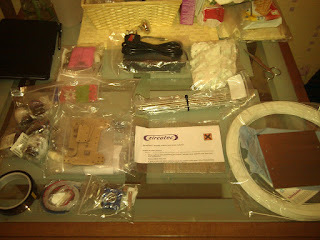 I haven't counted all the parts, but I think there must be 500+ individual components here to make up the build. The cat wasn't included. The box contents layed out - as you can see everything required for the build is in the kit, including a power supply, and even 300g of PLA material to start you printing objects - apparently 300g is the amount needed to commission the machine, and to print off a full set of parts for the next machine to be built - or a set of spares of course, which knowing my heavy hands, is likely a necessity for me. 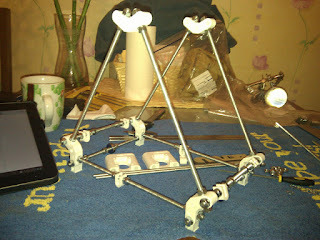 First assembly point is the two frame triangles. These consist of six threaded rods, four printed corner base parts which also double as the machines feet, and two printed header blocks for the top of the triangles. The assembly instructions indicate "some fettling may be required" on the printed parts - this has proven true on every printed part so far - if you intend to attempt one of these builds, make sure you have a set of small files handy - a needle file and a half round as absolutely essential for putting this beast together. You'll also need a 10mm spanner for the hundreds of nuts and bolts required, and a decent full sized metal file to dress the end of the rods - every rod supplied needed to be dressed before I could thread the bolts on. There are ways around this, for example, if you thread two nuts onto the 'good' end of the rod and wind them all the way to the 'bad' end, you can with some force effectively re-thread the 'bad' end. Not having a proper tap and die kit to hand, I used both of these methods, although in retrospect, proper dressing with the file, and then using a tap and die would be the 'proper' way to have gone. 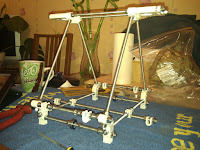 The U shaped printed parts in the middle of the rods will support the Z axis stabalisation rod later in the build. 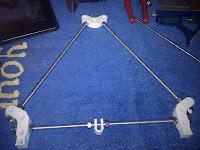 Here we have two assembled triangles - at this stage I haven't done any fine measuring and locking off, as this will be done when the basic frame is assembled. I did try and get it all within 1mm though to try and save time later. 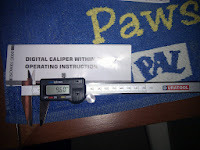 Just a quick note about other useful tools you'll need for the frame build - vernier calipers (minimum 150mm, 300mm preferred, digital are more accurate - which ever you go for, make sure that they have blades for inner and outer surfaces as in the picture below) , sturdy snub nosed pliers, needle nose pliers, flat and Philips (cross head) screwdrivers, a couple of squares (I used a small set square from a maths kit and a larger 300mm builders square) and a sturdy ruler of at least 300mm. A full set of tools required is on the eMaker site, under the Huxley build instructions, but I'll mention a few that I found essential here in this blog as the build progresses. 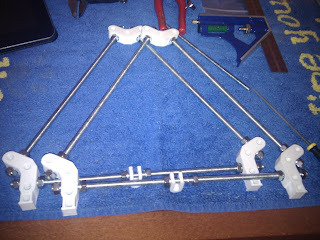 The next step is to assemble the four separator bars which sit between the frame triangles, and complete the form for the basic machine chassis. 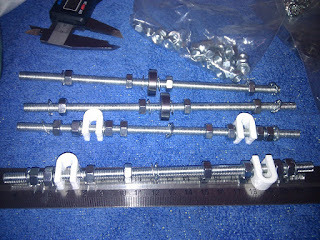 These consist of the four threaded rods, pre-fitted with restraining bolts, bearings on the bottom bars, and further U shaped printed parts which will hold the bed mount slide rails in a later stage. 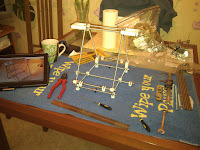 eMaker's instructions are pretty clear on these build parts and I did't have any issues with the assembly, except for a tight bearing which needed some persuasion halfway down the rod to get it to it's rough home position. 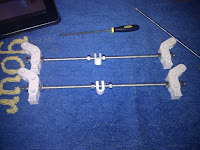 The method I used for this was simply to put a smooth washer and a nut in front of the bearing and use a spanner to move the nut, washer and bearing into position. Once the four separator bars are in place, it's a good idea to start measuring everything to ensure that you have a square external base. Again, this is just a check to make sure things don't drift to far out, as there is more to add to the base yet, however I noticed that moving the frame around loosened nuts as I hadn't fully tightened anything at this stage. All the advice I'd read online indicates that the more square and better aligned the base is, the better the end prints will be, so I preferred to check frequently. At this stage, once I was happy with the frame triangle and the base square measurements, I fully tightened off the nuts against the serrated washers so that it wouldn't drift any further, although I fully expect to need to make further adjustments before comissioning the machine. 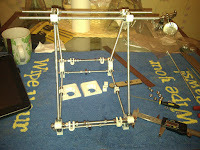 The pictures above show the top rods installed and the Z axis motor mounts. 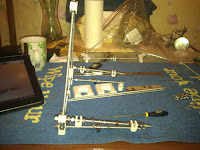 In the far right picture you can see that I've also installed the smooth Z axis rods into their rough positions. It's essential that the smooth rods are properly aligned, so I took plenty of measurements from all angles and double checked with a square that these are set up properly.